Well we are now midway through the summer break and according to the papers have just passed the worst day of the holiday for parents. One of the mainstays of the summer break is the “Summer reading Challenge” and this year they have linked with the Guinness book of records to promote the theme of Record Breakers; this is bound to be a really popular theme and it would be great if they could break the million participants barrier. 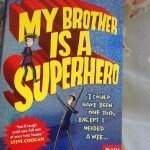 Some of the books that could prove popular over the coming weeks are”My brother is a Superhero” by David Solomons, which follows the adventures of Luke and his brother Zak. Luke is a mad comic fan and totally in to superheros, whereas his brother is more into homework. 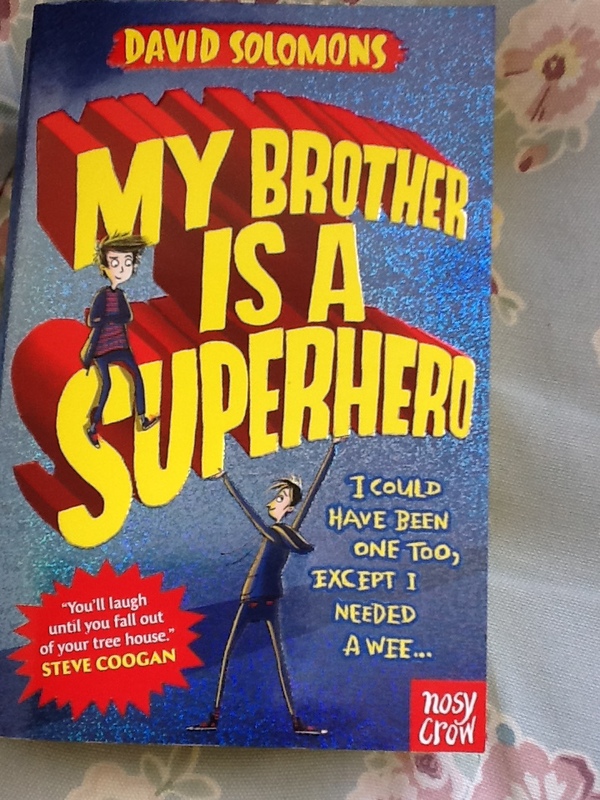 Due to an urgent need to go to the loo, Luke misses out on getting superpowers and has to help his brother come to terms with becoming “Star Lad”. When an asteroid heads on a collision course with Earth it is up to the two boys, together with friends Serge and Lara to save the day;despite the machinations of a crazed Comic Empire owner. 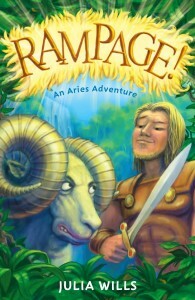 “Rampage” by Julia Wills is the second in a series of books about Aries, the ram from the legend of the Golden Fleece and it is set in the Amazon jungle. This story continues the adventures of Aries and his friend Alex, together with the ‘Hero’ Jason, as they try and save their friend Rose from the grip of the evil Medea. One again we have a story full of humour and adventure thanks to the ram with attitude. 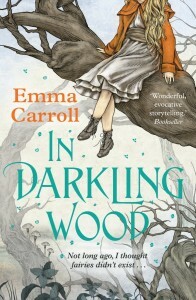 “In Darkling Wood” by Emma Carroll is yet another brilliant book by this author. It is the tale of Alice, who is sent to live with her grandmother when her young brother is taken into hospital. When she arrives she finds that there is a local campaign to stop her grandmother cutting down the Darkling wood that surrounds the house. This is a story full of magic and mystery and has links to the tale of the Cottingley fairies which was a public sensation just after the First World War. Alice does not want to leave her family and the bleak atmosphere at Darkling Cottage does nothing to help. This is the third book I have read by this author and they just keep getting better and better. 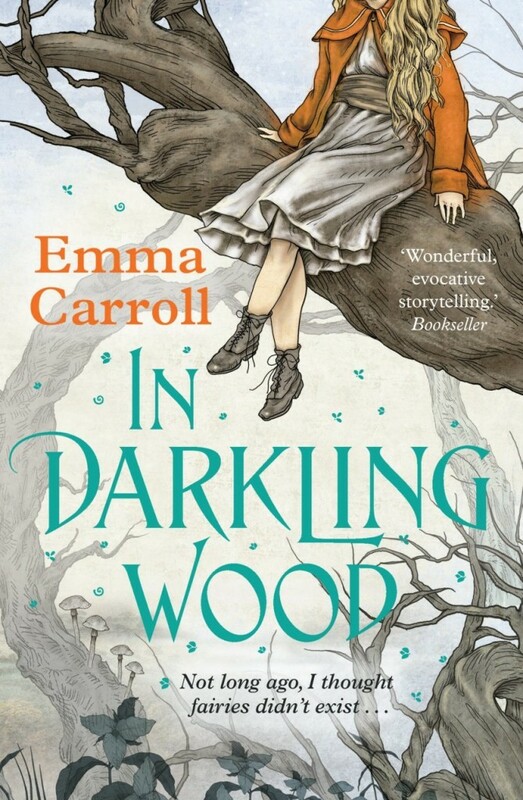 Of course I might be slightly biased as Emma Carroll is a graduate of the amazing writing course at Bath Spa University. There has been a real surge in the number of books with school setting, especially boarding schools. The actual stories range from mystery and magic to murder and mayhem and they seem to cover from 7 to 17, so something for everyone. 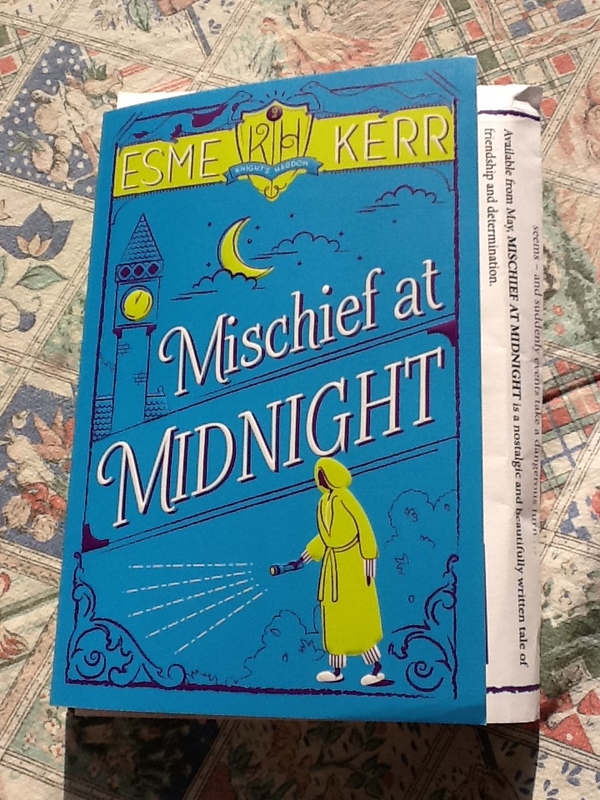 “Mischief at Midnight” by Esme Kerr is the second in a series about Edie and her friend Anastasia who attend Knight’s Haddon and this year they have to cope with new girl Janet, a mystery at a local tower and environmental protesters. It is a great story about friendship and is full of excitement and adventure, so we hope for more to come. August brings a new title from Louis Sacher, author of “Holes” and this one is called “Fuzzy Mud”. It is about bullying at school and also the issues surrounding genetic modification of food. This is a great read with a very serious message underlying it. 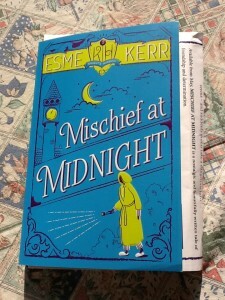 Thanks to Bloomsbury and Netgalley for the opportunity to read this. 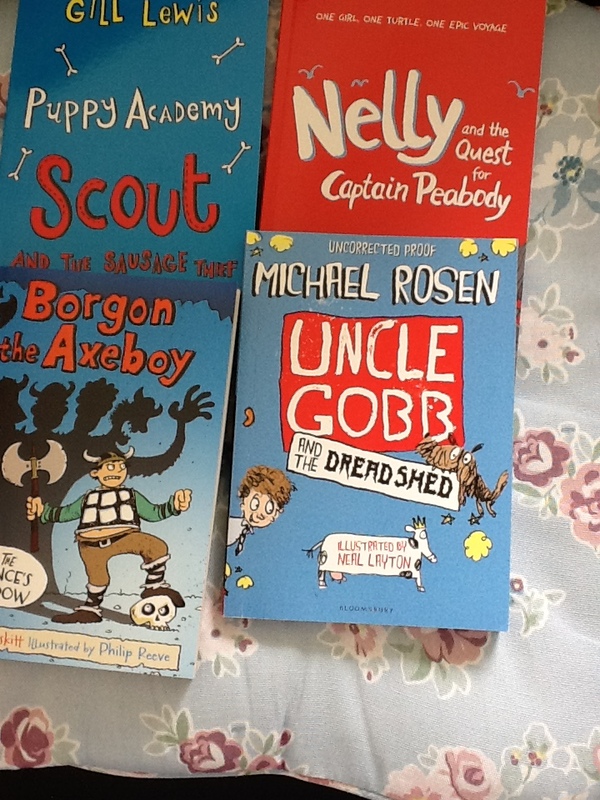 For younger readers there are lots of great reads. 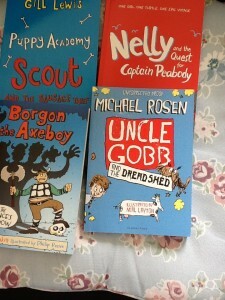 Michael Rosen has got a new character who makes his first appearance in “Uncle Gobb and the dread shed”. It is a totally whacky story about Malcolm and the frightening Uncle Gobb who lives with the family and is very strict about homework etc.Neal Layton’s illustrations are dramatic and atmospheric and add so much to the story. While Gill Lewis has brought out another title in the Puppy Academy series, this one is called “Scout and the Sausage thief” and is about a puppy who wants to follow in her parents’ paw prints and become a police dog, a lovely school based tale. Kjartan Poskitt has a new tale about his barbarian hero called “Borgon the Axeboy and the Prince’s shadow”, this is full of action and humour with great illustrations by Philip Reeve. Finally we have “Nelly and the Quest for Captain Peabody” by Roland Chambers, a story of lost explorers, daring young heroines and dastardly postman pirates.